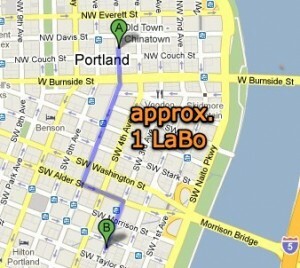 Lately I’ve been thinking of distances in terms of a strange unit you’ve never heard of: the LaBo. You’ve never heard of it because I made it up. It’s the number of steps between my house and the local Mexican restaurant, La Bonita. While I was actively writing my book I would go to La Bonita (which I lovingly call “LaBo”) every day to put in a couple hours of writing. Then I met Ben, who founded Walker Tracker, and I started wearing a pedometer. Each day I could count on at least the 3,000 steps that took me to La Bonita and back. I started to pay attention to step counts on other walks through the neighborhood. And I couldn’t help but think of them in terms of that daily jaunt down to get fish tacos. The hardware store is one LaBo away. A coffee shop on Killingsworth is about 1.5 LaBos, as is the tea shop on Alberta. A walk to the park, around the track and back? Just over a LaBo. But I don’t expect this unit of measurement to mean much to you. It’s from my house, after all. And these are the number of steps with my stride. The beauty is it takes something that I can feel and makes it more concrete. The Astronomical Unit helps make sense of how far away planets and other solar objects are using a unit that means more than billions of miles ever would. Step counts–and the LaBo–have had similar clarifying effects for me. What units could you use to help you make more sense of the world around you? I think it was Mr. Holznagel who once told me he knew a guy in high school who measured time in terms of “Flintstones,” the length of one episode of THE FLINTSTONES.